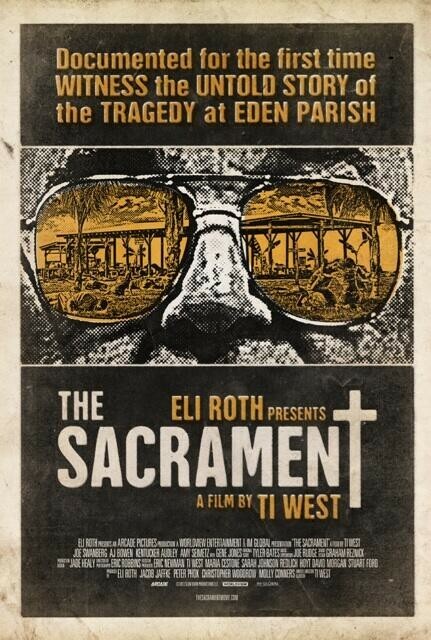 Ti West's THE SACRAMENT Gets a Release Date! Ti West's new film THE SACRAMENT has been playing a handful of festivals over the past several months, and has been building a considerable amount of buzz with each one of them. And why not? It's a new film from Ti West (THE HOUSE OF THE DEVIL, THE INNKEEPERS) about a crazy cult. Sign me up! Now, Magnet has announced a release date for the film. Fans will finally have the opportunity to catch this highly-anticipated piece of horror on VOD on May 5th, and in a limited theatrical release on June 6th. The film boasts an impressive cast with a good number of genre faves, including AJ Bowen (THE HOUSE OF THE DEVIL, THE SIGNAL, YOU'RE NEXT) Joe Swanberg (YOU'RE NEXT), Amy Seimetz (A HORRIBLE WAY TO DIE, YOU'RE NEXT), Kate Lyn Sheil (V/H/S), Kentucker Audley (V/H/S) and Gene Jones (NO COUNTRY FOR OLD MEN). Ti West has quickly become one of my favorite horror directors, and I can't wait to see what he has in store with this new film.